For anyone currently shopping for a ceiling fan Hunter and Hampton Bay are two of the most popular brands that you will see in stores and online. But which ceiling fan brand is the better buy? This comprehensive guide will hopefully answer your questions and help you make the best buying decision. Below is a quick rundown of each ceiling fan brand based on what buyers look for when shopping for a new ceiling fan. For a more in-depth look at each category keep reading below. Hunter is a company rich in history, started in 1886 by father and son John and James C. Hunter the company has been in business for more that 120 years. Hunter Ceiling Fan Company takes pride in their manufacturing experience, heritage history and industrial design team that develops products using the latest fan technology. Today you can find Hunter ceiling fans in many big home improvement stores as well as online wherever ceiling fans are sold. When compared to Hunter, Hampton Bay is a much younger brand being around only since 1986. The brand is owned by Home Depot and is a part of their growing number of house brands. Hampton Bay specializes in making not only ceiling fans, but light fixtures and outdoor furniture. Being a Home Depot brand, Hampton Bay is exclusive to the big box store and it’s online website. When comparing Hampton Bay vs Hunter ceiling fans the first thing many consumers look for is price. When it comes to price ceiling fans can be separated into 3 categories: Budget, Mid-Range, and High End. Budget fans (less than $150) are the cheapest of the three categories and also offer the least accessories and style options. For those who want a better quality fan, going with a mid-range will be a better value. Mid-range fans reflect their price and are made of better materials and include higher grade motors. High-end ceiling fans ($500+) feature the latest home trend styles, the best motors and highest grade materials. Those looking for stylish, energy efficient and noiseless fans may find the best value in high-end fans. It’s important to note that price is highly tied to quality when it comes to ceiling fans. If you are looking for a quality fan that will be a permanent fixture and last decades, a budget model may not be the best buy. Hampton Bay may be cheaper but is it better? Hampton Bay offers a great selection of budget and mid-range ceiling fan models yet severely lack any quality high end models when compared to Hunter. Hampton Bay is often cheaper when it comes to their budget models, especially when Home Depot runs a sales event where additional discounts are offered. From our research you can expect Hunter fans to be slightly more expensive than the cheapest Hampton Bay models. As mentioned above at the budget price level both Hampton Bay and Hunter are about the same. But build quality really starts to make a difference at the higher price points. 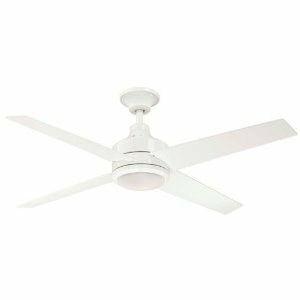 Many Hampton Bay ceiling fan models cap off at about $200 leaving little room for models that include high quality materials and technologies such as DC motors, heavy gauge metal, reinforced resin, etc. When it comes to fan build quality you will find that Hunter has far more high quality options to fit your style and preferences in their mid-range to high-end prices. Both Hampton Bay and Hunter offer limited lifetime motor warranties on their ceiling fans. Keep in mind that Hampton Bay is owned by Home Depot and you will most likely go through Home Depot for any warranty repairs or replacements. Hunter Ceiling Fans: Hunter features their trademark WhisperWind motors in all of their ceiling fans. This AC motor delivers powerful air-movement yet is quiet and ideal for bedrooms or living rooms. Hunter is also introducing newer DC motors into their newer and high-end models. DC motors are not only much quieter than AC motors but are far more energy efficient while providing a more powerful performance. Hampton Bay Ceiling Fans: Hampton Bay includes traditional AC motors in their ceiling fans. These motors are cost-efficient and allow for a cheaper retail price at purchase but they are not cutting edge technology. Hampton Bay has not yet introduced more than a few DC motor ceiling fans. DC motors are just starting to be introduced in their mid-range ceiling fan models but since DC motor technology is generally more expensive you will not find many of them. You will find a better selection of motor technology with Hunter fans vs Hampton Bay fans. Hunter wins this category based on their options and use of DC motor technology. 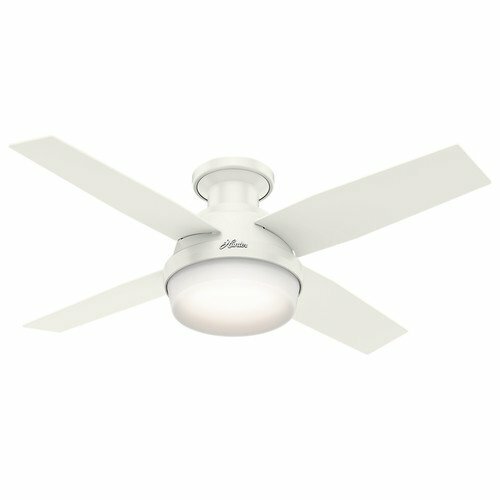 Hunter 59244 Dempsey Low Profile Fresh White Ceiling Fan With Light & Remote, 44"
Which brand is better for vaulted or sloped ceilings? Both brands include multi-angle installation options right in the box even in the lower end models. Most Hampton Bay ceiling fans include their Tri-Mount installation kit for standard, close-to-ceiling and angled installations. Hunter also does something similar with their Three-Position mounting system that is included with many of their ceiling fans. We recommend you check the ceiling fan specs to make sure an angled installation kit is included before purchasing a ceiling fan. Which brand is better for tall ceilings? For those with high ceilings, neither brand is better than the other. Most ceiling fans do not include extra long downrods for high ceilings and these downrods will have to be purchased separately. If you are going with Hampton Bay, the good news is that you can purchase your desired downrod right in the store or online when making your ceiling fan purchase. Hunter downrods are also usually available wherever Hunger ceiling fans are sold. Which brand is better for low ceilings? Both Hunter and Hampton Bay offer various hugger and low profile ceiling fans for rooms with low ceilings. Hunter may offer a better variety of budget and higher quality models however. If you are looking for the cheapest deal on a low profile ceiling fan then a Hampton Bay ceiling fan may be a better option in terms of price. Which brand includes a remote? This depends on the ceiling fan model. Both Hunter and Hampton Bay offer handheld or wall remotes with their ceiling fans with certain models. The accessories you receive with your Hampton Bay or Hunter ceiling fan depends mainly depends on the individual model’s price point. Keep in mind that cheap budget models usually do not include extra accessories like remote controls and are usually pull chain operated but most mid-range models do include some form of remote. Make sure to read the product description or box before you purchase your ceiling fan instore or online. In the budget price range you won’t see much of a quality difference between Hunter and Hampton Bay Ceiling fans. Those looking for fans under $150, especially under $100, will find quality, airflow and energy efficiency to be about the same whether they purchase a Hunter or Hampton Bay fan. However when comparing mid-range to high-end ceiling fans, Hunter consistently produces quieter, more reliable fans. Hunter also offers a larger variety of ceiling fan styles if you are looking for something unique and tailored to your home decor.